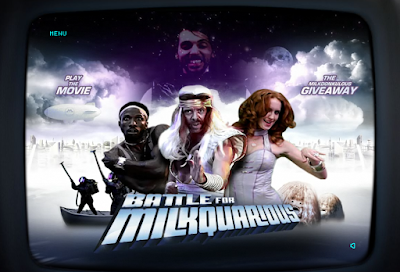 The latest from the Got Milk team is an epic advert in the form of a Rock Opera. Inspired by the likes of The Rocky Horror Show and Tommy it follows White Gold the Rock God as he tries to beat an evil villain who has stolen the city's Milk supplies and his girlfriend Strawberry. I bow down to the creatives at Goodby Silverstein & Partners who made this. Brilliant writing and direction. It is 20 minutes long and well worth it. It's zany, weird, funny and milkilicious. Is it just me or it does looks very Hitchhiker's Guide-ish...or maybe it's just me for being such a fan !